One of my most important life mottoes is: 'No expectations, no disappointment'. And very often I am pleasantly surprised of what is happening to me, especially when it comes to trips. Thus, I landed in Chemnitz, after one hour of delay while I re-discovered the spectacular Leipzig Central Station. And shortly after I arrived, on the way to the center, I stumbled upon the local Museum of Contemporary Arts. Not that I did not expected to find such a cultural offer here, but the exhibition menu was too amazing to be true: Allen Jones, a common exhibition Henri van der Velde-Munch (that I could not admire in his home at Oslo Museum), plus a surprising photo exhibition of Abbas Kiarostani. The local collection covers Romantic paintings plus a very select choice of sculptures, including among others Degas and Rodin. Can I get better than that? I spent here more than one hour without too many worries that due to being already late in town, I will have a lot of time pressure for seeing everything on my to-do-list list. With a happy soul and a smiling mind, I continued my walk to the central area, passing by a big head of Mr. Marx with a huge billboard with messages of unity of the proletarians, written in stone. Some kids were relaxingly playing break-dancing figures without too much care about their serious neighbour. 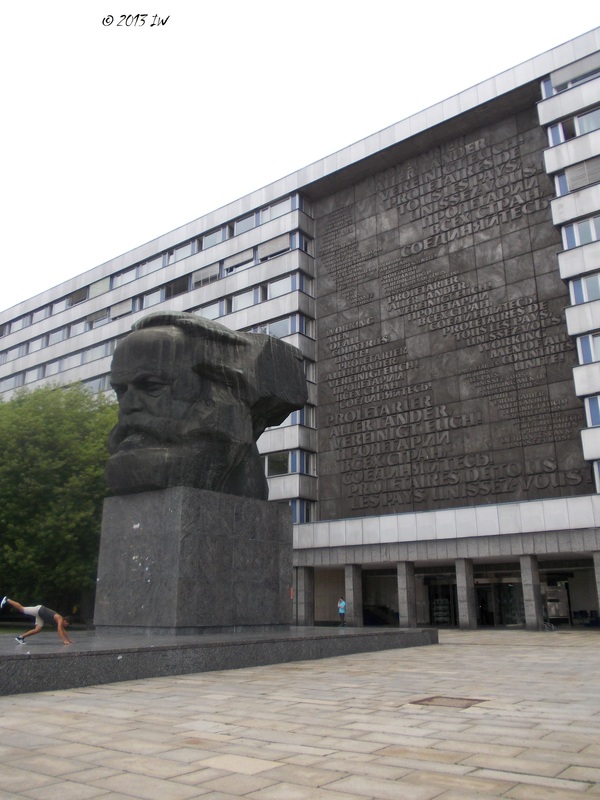 During the communism, Chemnitz was re-named Karl-Marx-Stadt, even though the German philosopher never been there or mentioned the city in his works. Curiously enough, I did not see any Karl-Marx-Strasse as I usually encountered in all the ex-DDR cities I visited. A couple of minutes distance of the terrible black head, one will suddenly enter the very busy and monumental shopping area, with at least 2 big malls facing each other. The architecture is a bit overwhelming and not necessarily matching the rest of the buildings, especially the town hall and some classical art nouveau and Jugendstil constructions. The local selection of vegetables sold close to the outlet shops bring more friendliness to the invasive setting. I was not interested at all to check the latest sales so I decided to take a local tram for reaching the 'old area'. The trams are moving very fast and with my 4 Euro daily ticket I was able to easily travel from a part of the city to another. It is a cheap and fair variant. During my long tram trips - most of them looking like old remnants from the communist times - there were at least three serious controls so be aware of respecting the local laws! The 'old' area is made up of various big houses, not all of them fully reconstructed, but many in process of repainting. The old and new buildings are surviving on the same street, a reminder of the complex history of this country. 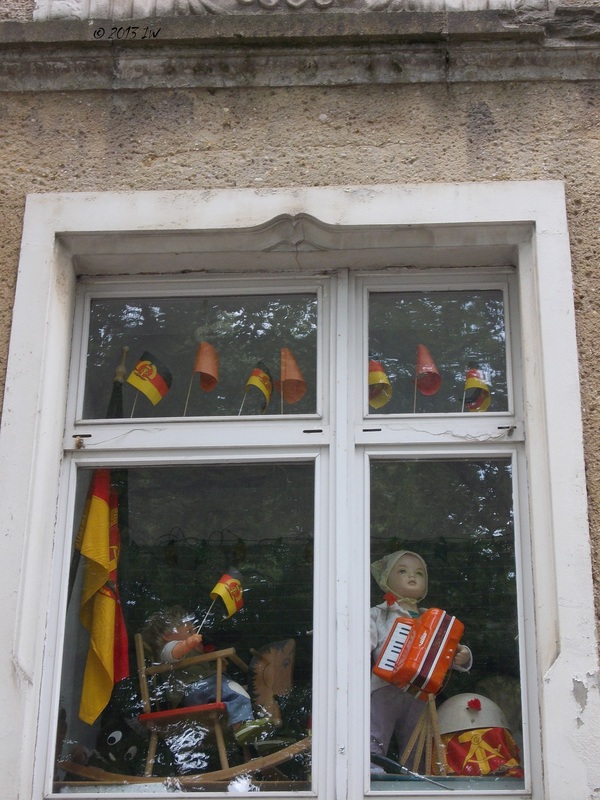 No, this image is not from a remake of 'Good bye Lenin', but I spotted with my eagle's eye on the window of a building in the 'old Chemnitz'. Curious to see more from the city, I took the tram on a different direction, and did not stop till I arrived at Ebersdorf. I am sure I did not plan to go in this part, but somehow got lost - the map of the bus and tram network looks very intricate - and decided to live my life at its fullest. The only available option was to walk a little bit in the woods and I did it breathing deep for 10 minutes. 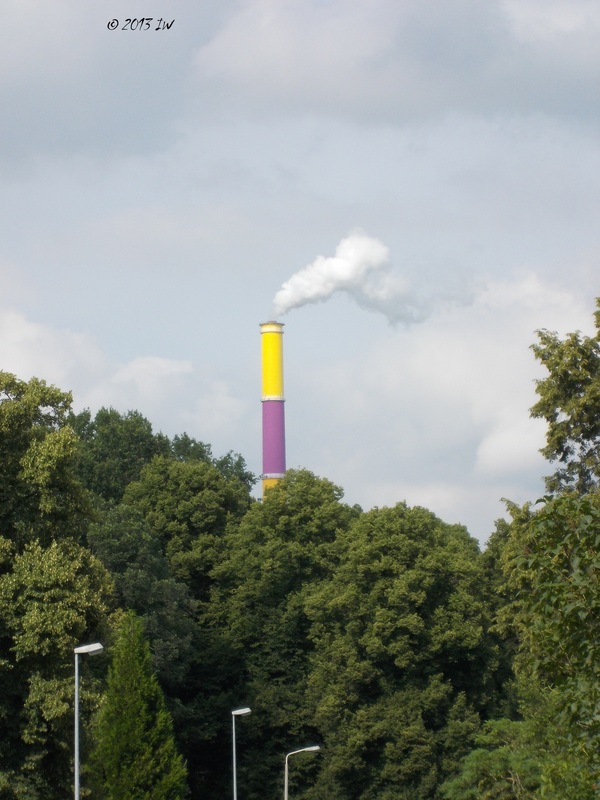 Often compared with Manchester from the point of view of the concentration of industrial activity - haven't been there and I am more than sceptical when it comes to comparison between countries and cities anyway - Chemnitz has enough parks and green areas to compensate the pollution uttered by the big industrial towers. Some of them were colourfully painted in order to make them more human friendly. 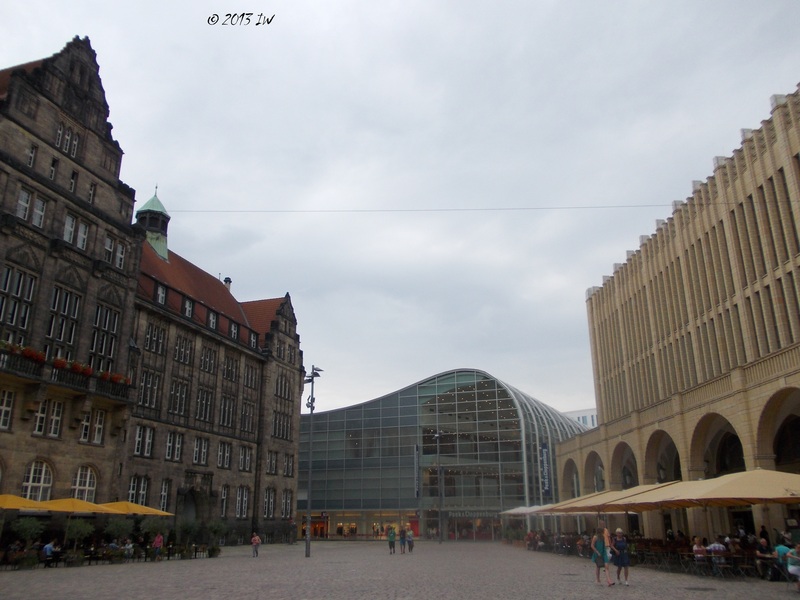 Back in the central area, I wanted to have a look at the Museum of Natural Sciences and to some Jugendstil buildings. Around 3pm, the area is getting more and more busy with people coming back from work. Time to realize that I don't have too much time left so almost hurried up to Schlossberg area, for some lake relaxation, and a little visual panorama tour of the city. The tourist opportunities includes a museum of local history - featuring a fashion exhibition during this time of the year -, many restaurants and caffes, with regular concerts and a biergarten. If not, a simple trip in the little garden can be relaxing enough, especially for someone busy to get back on the road as soon as possible. In a hurry, as usual, I took the tram back trying to spot as much as possible people and buildings. 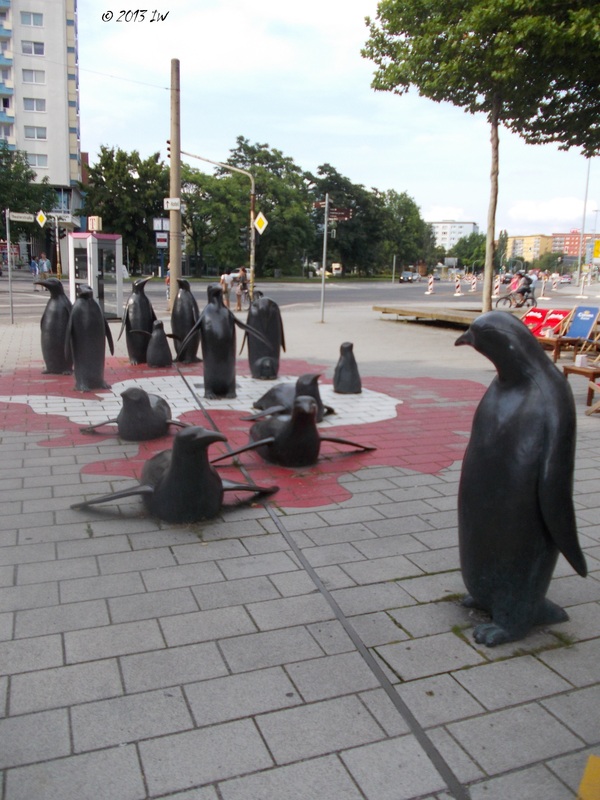 As on the way to Schlossberg I saw some funny statues of penguins I stopped by to see what are they all about. The presence of the penguins has a very serious and symbolic reason. Chemnitz has apparently the same shape as Antarctica and that similarity is a good opportunity to set up a group installation of them in town. The children love them, taking them for horses maybe. The tram journey to the central station was punctuated by the English announcement of the stops. Before leaving, I admired another irony of the history of local architecture: a very elegant villa, former private residence of a rich resident of the city in the 19th century, turned into a restaurant and dancing school is facing a furious statue of united proletarians. Nothing surprising enough for me, to be honest.